If you follow me on Instagram, you know I've mentioned that March is National Nutrition Month and this month's theme is Go Further with Food. I've been making an effort all month long to try something new at least once a week on Tuesdays. I even called it #TasteSomethingNewTuesday (catchy, right?). Last week, I made an egg, red pepper and parmesan sub I saw on Laura Vitale's Cooking Show. The week before I made romaine lettuce wraps filled with scrambled eggs, bacon, and black beans for breakfast, which were surprisingly awesome, by the way. But lately, I'd been craving tacos, especially veggies tacos I had never tried. On an episode of Tia Mowry at Home, Tia made veggie tacos with roasted butternut squash, kale, and avocado for her guest. Though I didn't want butternut squash, I was definitely feeling for sweet potatoes instead, with kale, black beans, and avocado. Thus, I had my new idea for #TasteSomethingNewTuesday to help me #GoFurtherWithFood. I also had catfish on hand and what's the point of making tacos if you're not going to make fish tacos, amirite? And boy were they awesome! The spice mixes I made for the veggie and fish tacos, respectively, gave these tacos so much flavor. The key ingredients to giving the sweet potatoes a deep, warm flavor with a kick were chili powder and brown sugar. 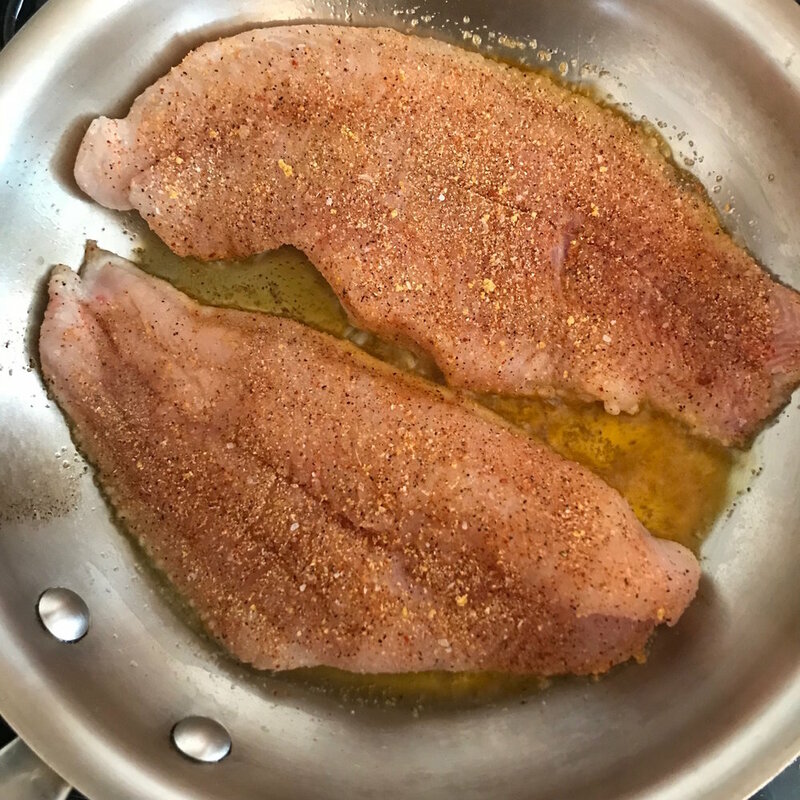 Creole and adobo seasoning gave the catfish the cajun flavor most enjoy in pan-seared fish tacos. The quick-sautéed kale added a nice crunch and slight bitterness to compliment the sweetness from the potato, and the beans added a great punch of protein, fiber and texture to the dish as well. In regards to the avocado, was it necessary? Probably not. But avocado is awesome soo...it will always have a home in the tacos I make. For my fish tacos, I made a light mayo-based cilantro and cabbage slaw. It's a condiment that adds so much texture and fresh flavor and can be made easily in minutes. Now, if you're going to make these two different tacos together, you're gonna be in the kitchen for about an hour, including prep and cook time. However, you don't have to make them both at once. But, I do recommend making the sweet potato and kale ones first if you want to try something new, which is why you're here, right? Great! Let's get to the actual recipe, then! Simply combine each mix in separate bowls. Heat a skillet with 1 tablespoon of canola oil. Add the sweet potatoes, pour on the spice mix and stir to combine. Cover and cook on medium low heat for 10 mins. Stir periodically to keep seasonings from sticking. Sprinkle an extra 1/8 of kosher salt on the potatoes once they're finished. Move the potatoes to the side of the pan that's not directly over the burner to make room for the kale. Sauté the kale over medium-high heat for 3 minutes until it's slightly wilted. Serve on a warm corn-flour tortilla with avocado. 1/2 tsp of garlic powder, salt and pepper. T'ara's Tip: If you have extra beans and sweet potatoes left, save them and use them for breakfast tacos with scrambled eggs! Heat a skillet with 1.5 tablespoons of canola oil. 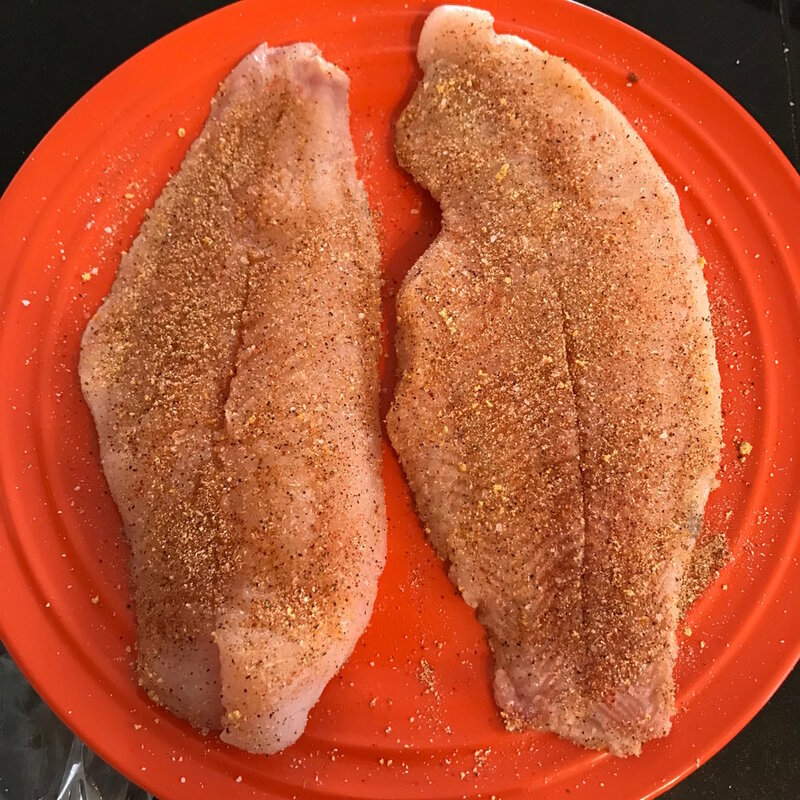 Season the fish on both sides with the spice mix. Cook on both sides over medium heat for 4 minutes until browned. Serve on a warm corn-flour tortilla with mashed avocado and top it with cabbage slaw. How did you enjoy this recipe? Let me know in the comments!